While I was doing the dishes the other night, my one year old came into the kitchen wanting my attention. I stopped and played with him for a few minutes. But then I returned to my dishes. A few minutes later he stood next to me, tugged at my pant leg, looked up at me, and said, “Momma, Momma”. He had never tugged on my pant leg before! This time I decided the dishes could wait. I got on the floor with him and played with the blocks and giggled. As a wife and mother it can be SO easy to focus on taking care of all the physical needs of our families. Clean laundry, well-prepared meals, and a clean house. But what their souls need is our time. Yes, my guys need clean clothes and food to eat, but in all my doing for them, I can’t forget about simply being with them. 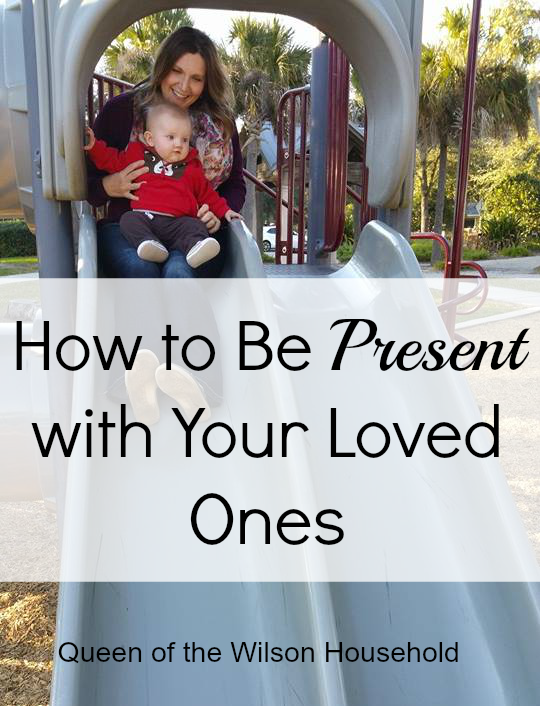 When was the last time you were completely present with your spouse or children? Did they have your complete attention? Being present really doesn’t require much. It just means making choices. For this season in my life being present looks like this. talking to my husband, and while I’m out to eat, or at events with others. day. When he gets home form work, I stop what I am doing, sit on the couch, and we talk. Read and sing to my son throughout the day. Tickle and giggle with him. Sit on the floor and play next to my son. Play and talk to him while his is in the pool. that I can focus on my family instead of all my thoughts and to-do lists. How do you choose to be present with your loved ones? Is there supposed to be that full link right there? Just wanted to check. You are so right on how easy it is to be present for your loved ones. Sophie always does the tugging on my clothes, so I often hold her while doing things like cooking or cleaning dishes. Most of the time we just spend the evening sitting around enjoying the time we get together since we get such little amounts of it. Liz, thank you for pointing that link out! I had no idea it was there. I've never thought about that scripture in terms of being with your family. What good food for thought! Thanks, Jenny! It was the first scripture that came to mind when I was writing this post. Relationships with our loved ones are so important.